Last Friday, we were at the Natural History Museum Lates event, the monthly NHM public 'open house' events showcasing new science: people drop in, have a drink, chat to scientists, talks, interactive sessions etc. 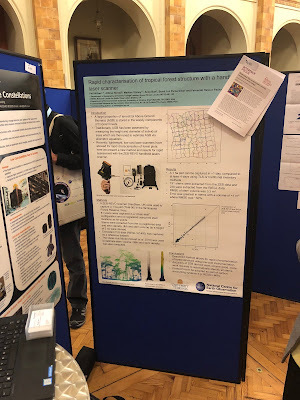 This one was showcasing NERC science, and in particular the 2018 Impact Award nominees. My NCEO colleague Shaun (Quegan) was up for the Economic Impact award for leading the ESA BIOMASS mission, and I was helping out on the stand, showing the TLS stuff we're doing for BIOMASS cal/val. BIOMASS is being built by Airbus in the UK under a 180M contract from ESA. So, definitely impact, and Shaun went on to win the award on the Monday - yay! 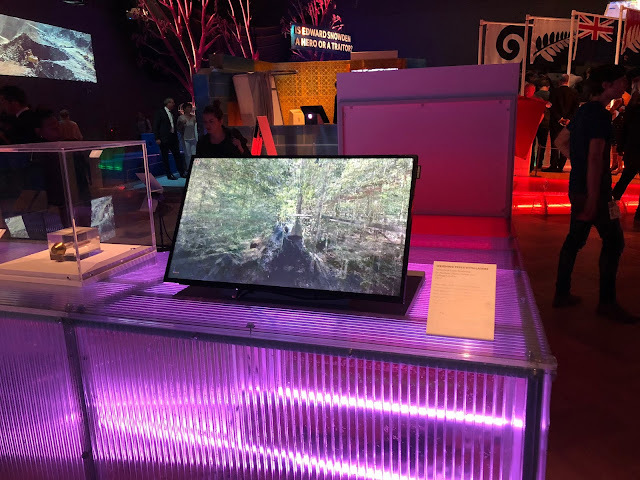 We had a stand with a film produced by Sheffield University, a model of the sensor from the Airbus team, some tree discs, my 3D movies and the ZEB-REVO, and movies of deforestation impacts from Joao Carreiras (also from Univ of Sheffield). My son Rudi came along for a mooch about and I got him to make himself useful and collect some ZEB data in the NHM main hall. He did a great job. Section through the NHM main hall, whale in view, with people milling about below. Scan R. Disney. Looking down from the balcony. The NCEO/BIOMASS stand is on the opposite side, just above the whale's head. The giant globe is the Earth installation by visual artist Luke Jerrans - which was also spectacular! Scan by R. Disney. Walk-through of the ZEB-REVO data collection. Animation by Phil Wilkes. The sketchfab models are pretty nifty too (as always). We had a lot of visitors to the stand - Shaun and I literally didn't stop talking from 6-9:30. Not *that* unusual for me, but definitely for Shaun! We had lots of great discussions and questions from visitors and I really enjoyed it (which is the main thing). The event seemed really successful, with about 3500 visitors on the night, and capped with Shaun's win at the award dinner on the following Monday. And meanwhile, congratulations to the NASA GEDI team - successfully launched to the ISS on 5/12/18 - let the lasering of forests commence! Great news. A few updates on some of our activities over the past month or two. Most excitingly, this involved a destructive harvest experiment in Caxuianã, where we first scanned in 2014. Andy and Matheus led the experiment to scan, cut down and weigh four large tropical canopy trees. The aim of this work is to provide the best TLS estimates of tree volume we can, and to compare these with the harvest values. 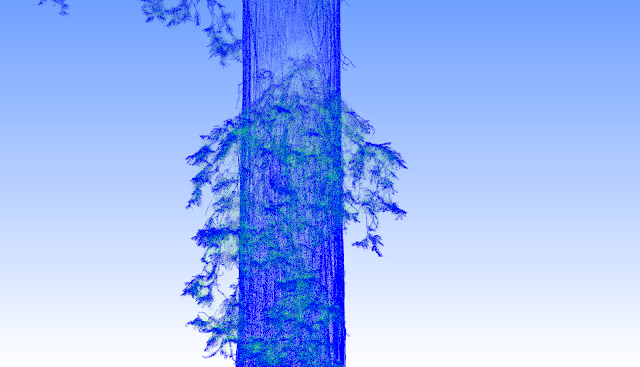 We also wanted to make measurements of wood density, as a function of tree diameter and with height. Wood density is critical in going from volume to mass of course. But it can vary a lot within and between species and even within a single tree. 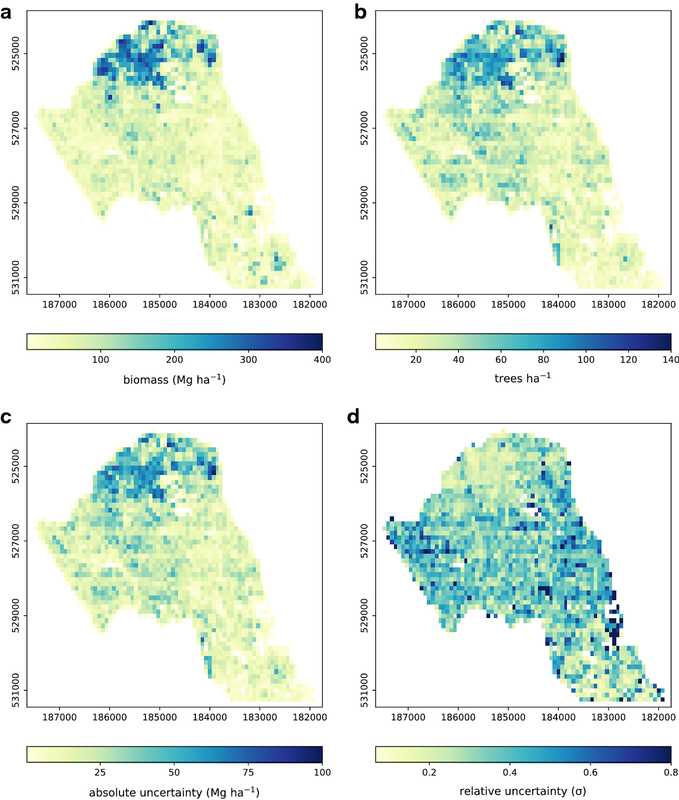 In the hyperdiverse tropics, the relative lack of wood density measurements may be one of the big uncertainties in forest biomass estimates based on allometry - size-to-weight relationships - that convert tree diameter (or height from satellites) to biomass. That's ALL the estimates then. Here is a 46 m tall, 20 ton tree coming down. 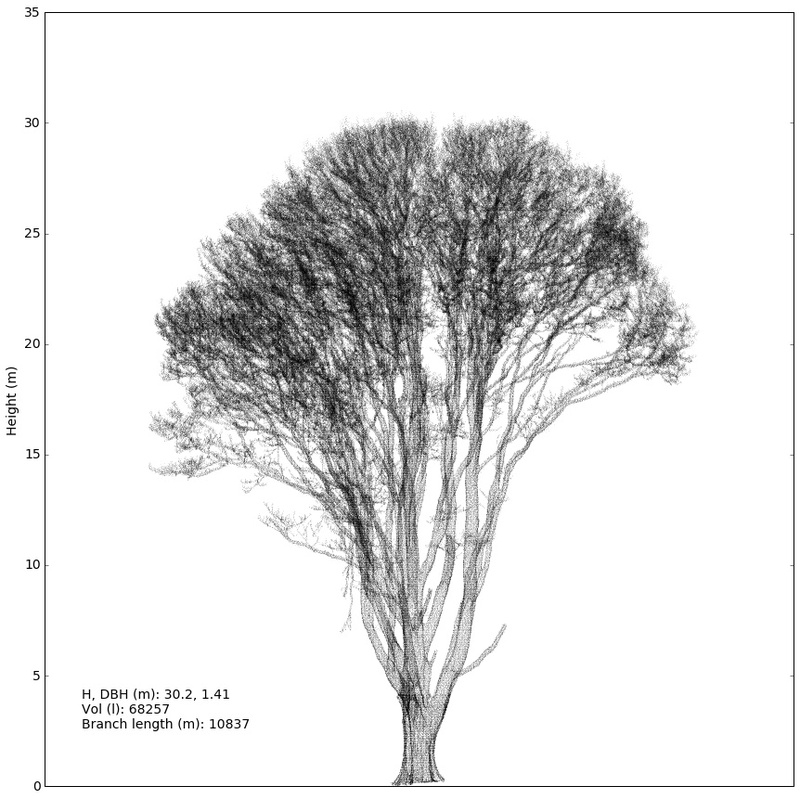 The team did an amazing job of clearing around the tree to give a fantastic, clear view with the TLS - some of the best data we've ever been able to get for a tall tree like this. This is a highly-skilled job as you can see. I very much have mixed feelings about this - it's hard to watch a tree like this coming down and knowing you're responsible for it. 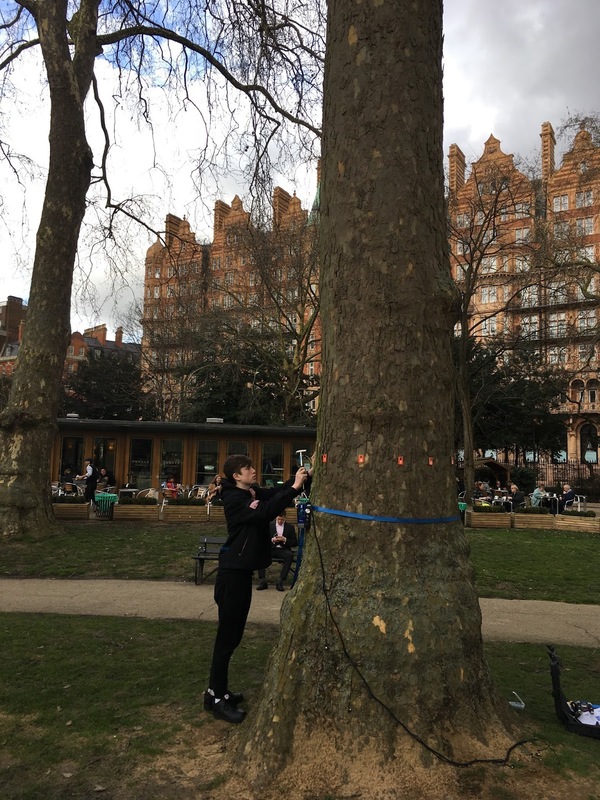 The flipside is that if we can show how TLS can work in weighing trees like this, we can massively improve our estimates of global forest carbon stocks, particularly in the tropics where few trees of this size have ever been weighed - and none have been done like this with TLS in the Amazon. The tree weighed over 20 tons wet, probably half that dry, of which half again (~5 t) is carbon. Early results show the wood density is a lot more variable than we'd ever expected - a problem for converting volume to biomass with a single value, but really interesting in scientific terms. Regardless of the mechanical properties, it's easy to see why these trees are so commercially valuable just on the basis of the beauty of the wood. Prof. Lola da Costa (far right) and the chainsaw team weighing a large. and beautiful, piece of hardwood trunk. Matheus (front left) and the team with the results of cutting up the tree above. Giant heavy beermats. An interesting aside - when we came back, Feng Yin pulled down the Sentinel 2 satellite data covering the period the harvesting was going on - a few days before and over ensuing couple of weeks. Amazingly, the gaps due to felling 3 trees can be seen from space at 10 m resolution! The NDVI images highlight this even more. A sobering thought - 3 trees and some clearing leaves a hole that can be seen from space. Sentinel 2 images showing the site and the tree harvest area circled: dates are 26/09, 1/10, 6/10, 26/10. NDVI generated from the images above, highlighting the holes in the canopy. 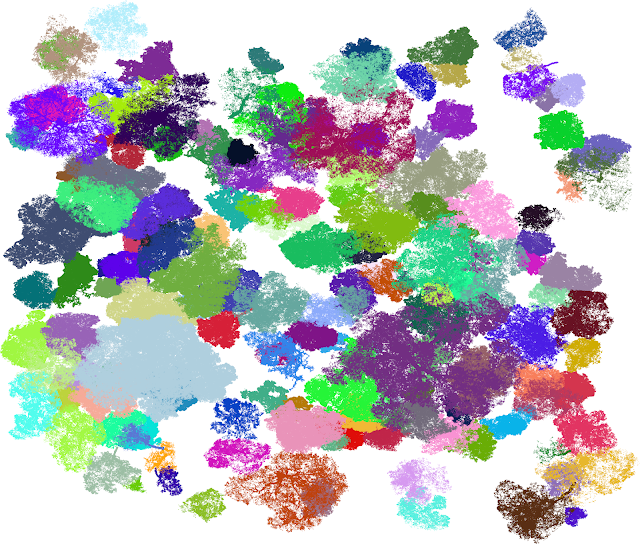 Early analysis by Andy and Matheus already shows some amazingly clean point clouds from the TLS, which will allow for high quality reconstructions and estimates of volume from the TLS. The wood density is also showing some very interesting variations! Huge thanks to Lola da Costa who organised the local teams - without him this wouldn't have worked at all. Also huge thanks to Patrick, Lucy, Ingrid and the local crew. Our leaf angle distribution (LAD) paper came out in AFM, which shows a new way to get at LAD from TLS and comparing this to a photographic method. LAD is an important parameter in understanding canopy photosynthesis. But it's very hard to measure so it's often assumed to be simply distributed to make life easy (and because we don't have any other info). 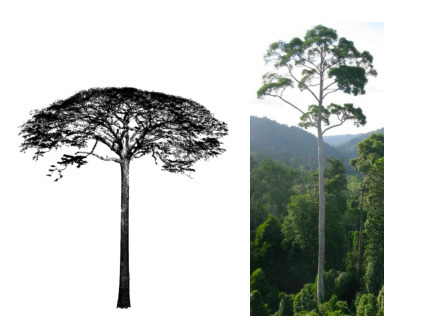 This work was largely led by Matheus and Jan Pisek, applying Matheus's leaf-wood separation to TLS data from Kew, and comparing to Jan's photographic method. It shows that the TLS method does surprisingly well even for small leaves and odd morphologies. Figure 8 from Boni Vicari et al. 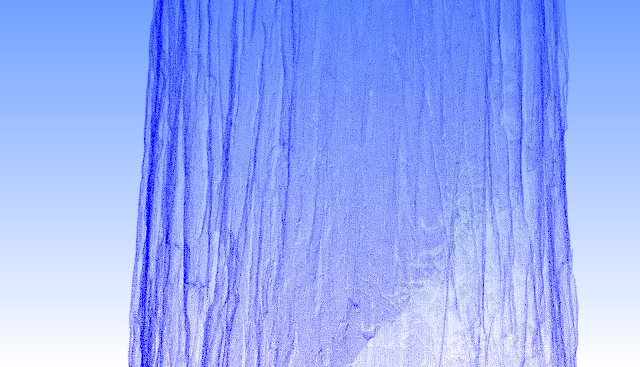 (2019) showing the TLS point cloud, separated leaves and extracted leaf angles. Here is a 46 m, 30 ton tree coming down. 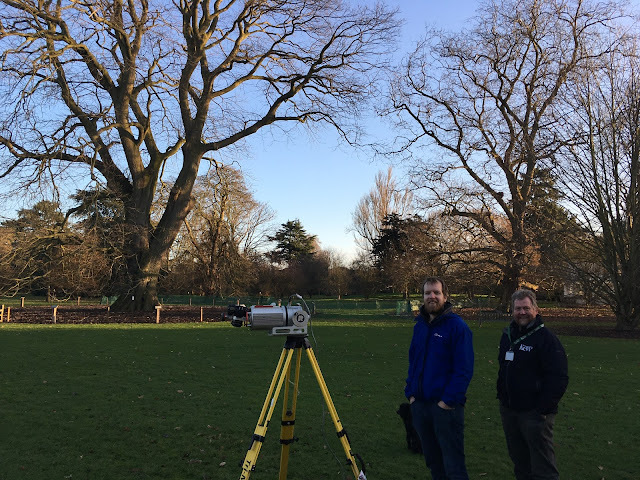 The chainsaw team did an amazing job of clearing around the tree to give us a fantastic clear view with the TLS - some of the best data we've ever had of the upper part of a tree like this. This is a highly-skilled job as you can see. 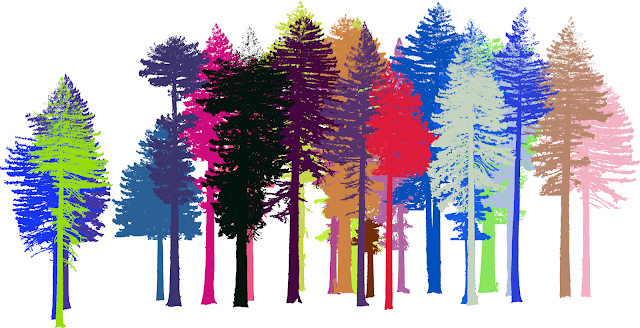 Two other papers accepted for publication are Andy's paper on treeseg, his tree extraction tool for TLS data; and Matheus's paper on leaf-wood separation, as part of his lidartf tool development. These are both potentially really useful tools for anyone working with TLS in forests. More on both those soon. 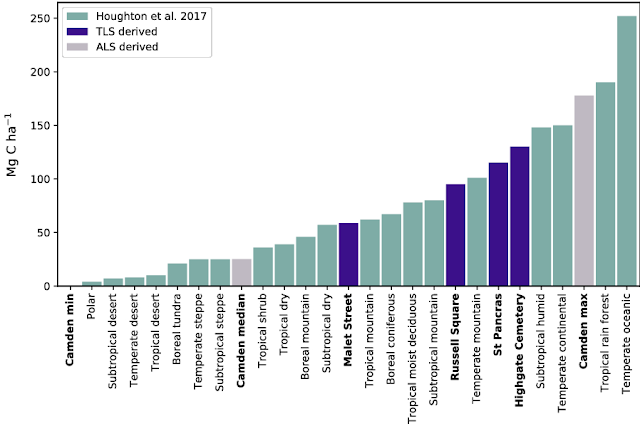 Lastly, my Tansley Insight piece in the New Phytologist, on the potential for TLS in plant science, has come out. I've had some very nice feedback from people on it, mostly to do with figure 1, the montage of trees sketched by my daughter's primary school class! People really seem to find it relatable - which was the original idea, but you never know if these things will work or fall flat. Our first slice of urban work, led by Phil, is out this week in Carbon Balance and Management (Open Access). We used a combination of TLS and the UK Environment Agency open lidar data to estimate the C density over the London Borough of Camden. 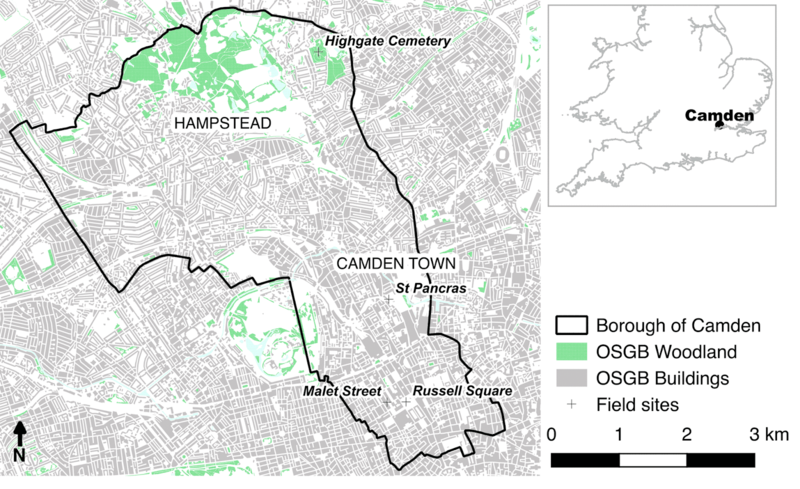 We show that the 85K or so trees in Camden have a median C density of 50 t/ha, rising to 380 t/ha in spots such as Hampstead Heath and Highgate Cemetery. Map of London Borough of Camden, showing the study area. These are values that wouldn't be out of place in the Amazon, albeit over very small areas. The figure below show the C density over the whole borough. 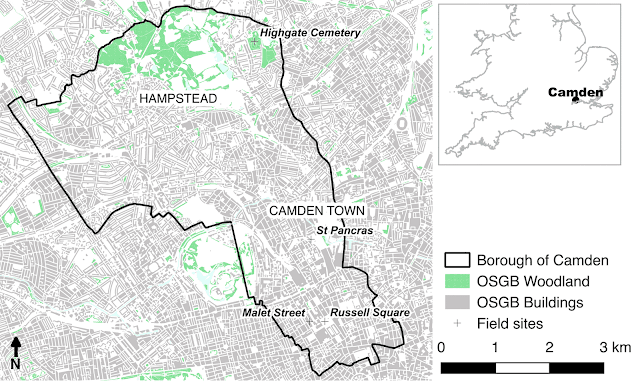 Comparison of Camden C density values to other biomes. The important aspect of this is not the total storage - clearly we are talking about small areas here! 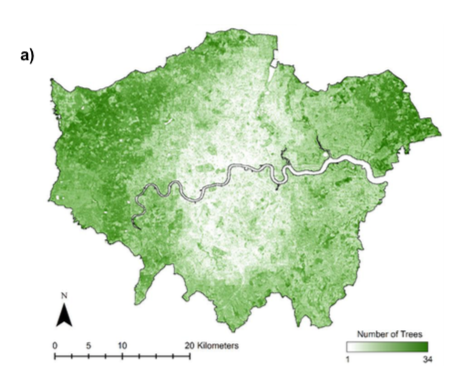 - it's that we are probably undervaluing the C storage capacity of trees in urban areas. And because we can choose where and how to plant them and can manage and protect them, they can grow very large and live long (and prosper). 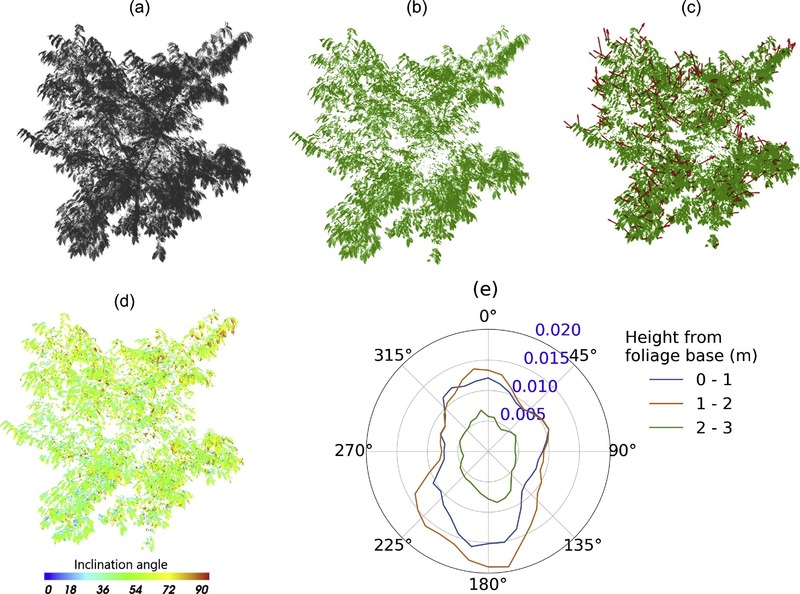 The other aspect we've found is that using allometric (size-to-mass) relationships for non-urban trees to estimate the mass of urban trees is problematic: due to their environment, urban trees have their own weird and wonderful shapes. TLS is the way to help quantify those differences. I've written a piece for The Conversation on this work, which seems to have gone down well, and there's been some excellent coverage of the article including the Times, and then online science and tech blogs (phys.org, Metro, Reddit - 15K upvotes and counting!). Dr. Kieron Doick, head of the Forest Research Urban Forest Research Group:"Urban trees are a very important resource for all those who live in, visit or work in towns and cities, for they provide us with a plethora of health and well-being benefits, and they keep these places cleaner and more attractive. 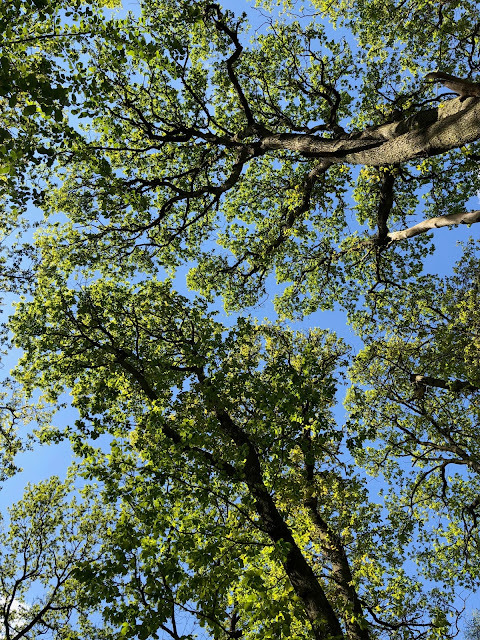 Canopy cover values released last year show that for some areas the abundance of trees is also higher than in the countryside (averaging: 16% (towns) and 10% (pan-England in 2016)). This means we should expect our urban trees to also be providing us will an important carbon sink, helping to combat the global trend of increasing carbon dioxide in the atmosphere. 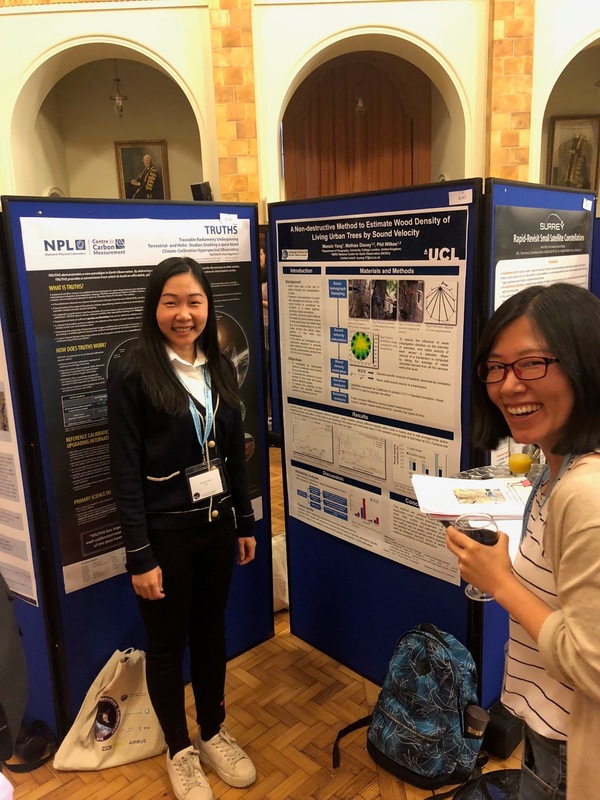 This new work by UCL is a welcome development in advancing this understanding, and I look forward to hearing how the work continues to develop." Councillor Adam Harrison, Cabinet Member for Improving Camden’s Environment :"Camden is really pleased to partner with UCL, based in the borough, in order to unlock the benefits of trees not just for our own residents but for people's benefit round the world"
We want to expand this work to other cities, both in the UK and elsewhere. Clearly, C storage is just one of the ecosystem services provide, and by no means the most important. But, if we can assess their value more effectively in all ways, hopefully it will help us plan and build better, greener cities. Scanning in the urban forest, Hampstead Heath. 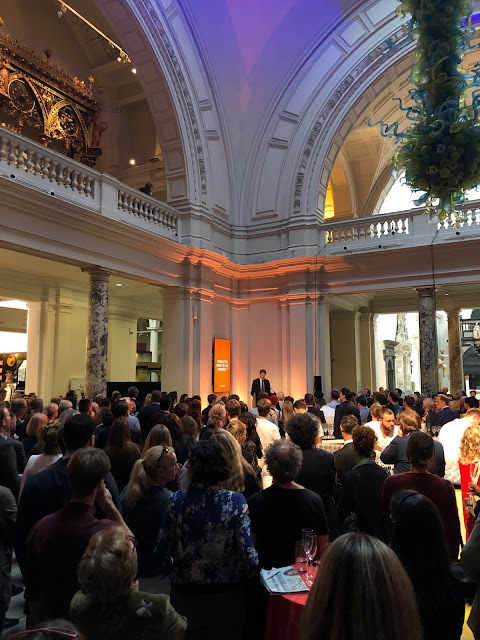 Museum director Tristram Hunt opening proceedings. And here we are! 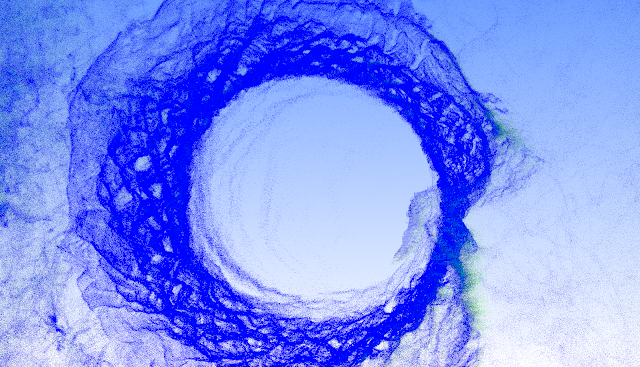 Our lidar animation from Caxiuanã, originally generated by Andy. I was approached by Rory Hyde, one of the curators of the exhibition along with Mariana Pestana, who wanted to include our 3D lidar work from tropical forests, as an example of how new technology is allowing us to understand and hopefully manage our world better. 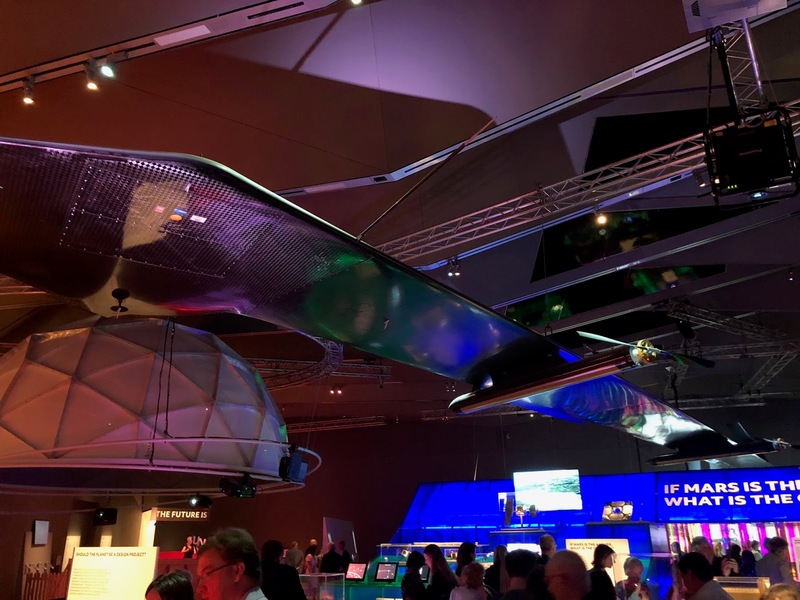 Other work included in the exhibition includes: a chargeable shirt which can power a phone; a drone ship which can clean up oil spills; an autonomous flying wing intended to cruise the skies using solar power and broadcasting internet access to remote areas; AI bots intended to help mediate and hopefully improve political discourse and democratic process. Lots of fun, thought-provoking and definitely worth a visit if you're in London between now and November. Aquila, the flying broadcast drone: as being developed by Facebook, obvs. 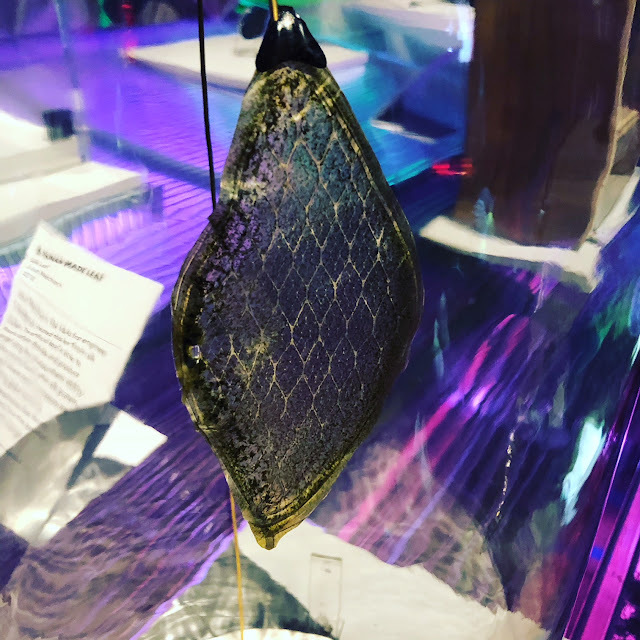 A man-made leaf that photosynthesises. Our work also features in the glossy accompanying book, and it's quite a thrill to see it amongst all the other incredible ideas and technology. I got to speak to some very interesting people whose work was also featured, as well as people passing who were interested in my work. There may be more connections arising out of this yet! Point cloud included in the glossy (£25!) book accompanying the exhibition. 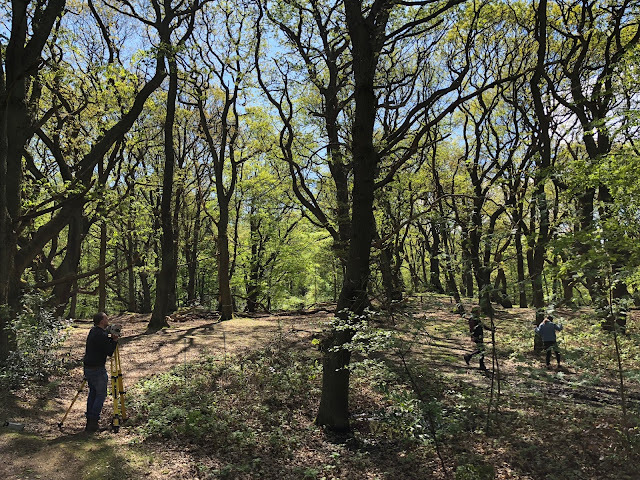 Activities close to home this week, with some scanning on Hampstead Heath to measure some of the coppiced oak woodland with our Riegl VZ400, on a gorgeous clear spring day. As befitting May Day and notwithstanding the ridiculous wintry temperatures and torrential rain the day before, this was as good as it gets. Hiding away in the well-heeled suburbs of Highgate and Hampstead, this is a real oasis in the city. Most of the trees are relatively young (20th C), but a couple of them, slight hill in the background below, are more than 200 years old. One of the lovely secluded oak stands, within earshot of the busy Spaniards Road. Crystal skies. Looking up through the crowns. Is that a cloud? 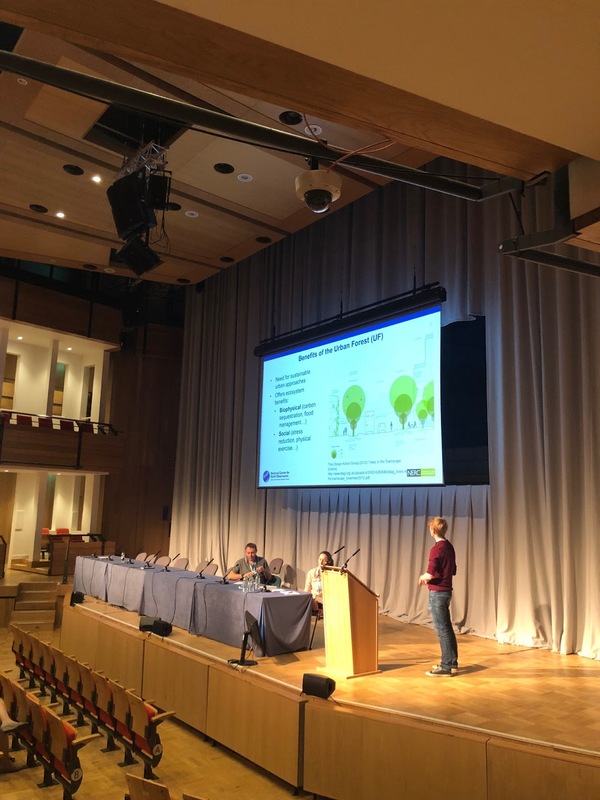 We're aiming to compare our estimates of biomass in the woods here with those from the local surveys done by the estate management. This has to be one of my favourite bits of London. Earlier that morning, I visited my daughter Lotta's school to talk to the Year 3s about trees. It's their Science Week and they're studying trees in and around the local area, including Epping Forest, which has the famous Gilwell Oak, the UK's 2017 Tree of the Year (yes obviously it's a thing!) and a nominee for European TOTY 2018. 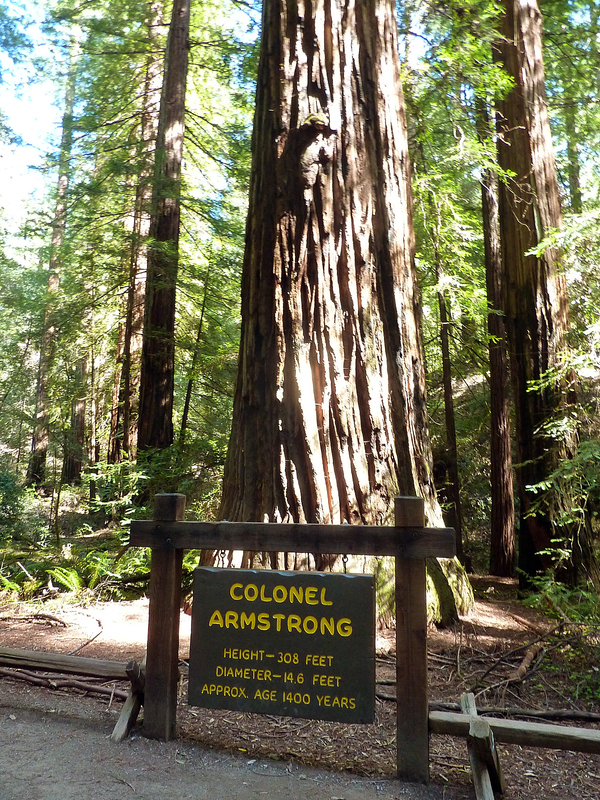 I showed the children some of our work, some of the oldest and largest trees in the world, and the UK. They seemed to enjoy finding out about the people and animals that live in forests around the world very much! I even took our ZEB REVO in to scan them while they 'stayed still'. ZEB Revo scan of the Jubilee School Year 3s listening intently with the adults sitting at the back (left). Back to Kew on a chilly morning with Phil, to meet Tony Kirkham, Kew’s hugely knowledgeable and accommodating Arboretum Director. 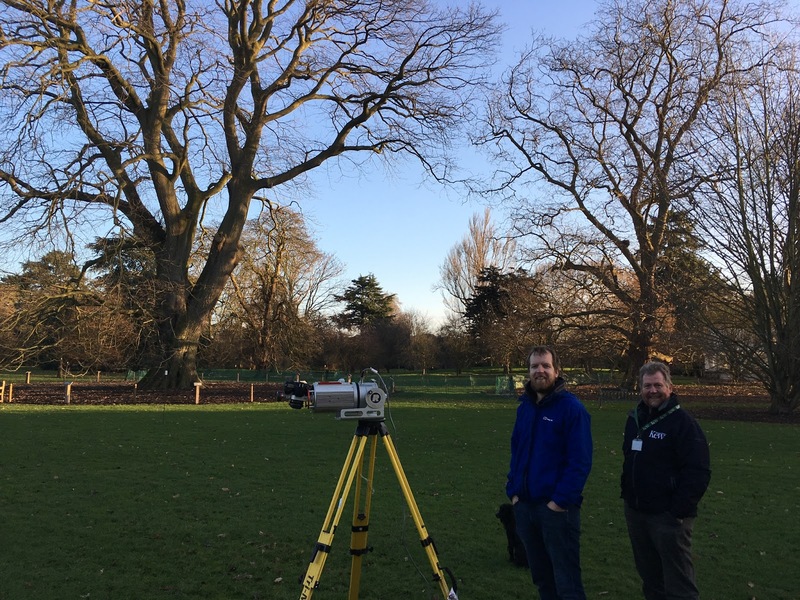 Tony invited us to come and scan one of Kew’s Champion trees - the tallest Chestnut-leaved oak in the UK. 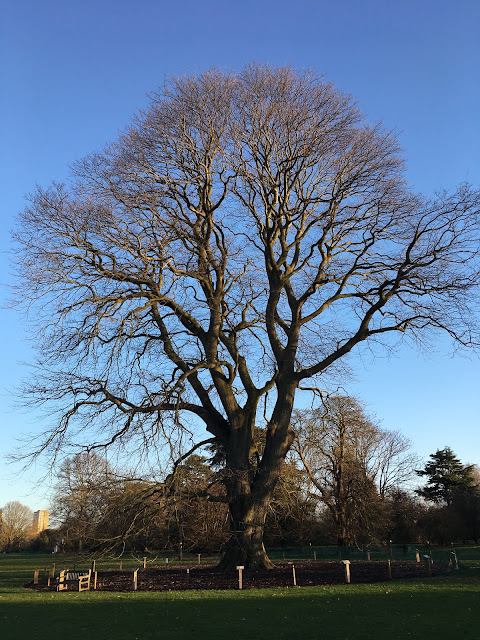 And it’s quite a specimen - I’ve not seen Quercus castaneifolia close-up before and this one is over 35 m tall and with some amazing secondary stems and boughs. It was a classic chilly London morning, but there’s worse places to work. I always learn stuff when I’m at Kew, particularly when I'm with Tony, about the trees themselves and their history and ecology but also about how trees like this need to be so carefully managed: air-blowing the soil around the roots to aerate them; pollarding the middle of the crown so it acts less like a sail in high winds, reducing stress on the trunk. And today’s word of the day 'Balanocultures: people that depend on acorns as a staple diet'. Also found out that the word Druid means ‘to know the oak’. Trees eh? UPDATE: check out the beautiful 3D model Phil has produced, showing the tree in all its glory. Turns out it's 36.5 m tall. Phil and I also scanned a sweet chestnut of unusual shape, which apparently featured as the model for the Whomping Willow in the first Harry Potter film. 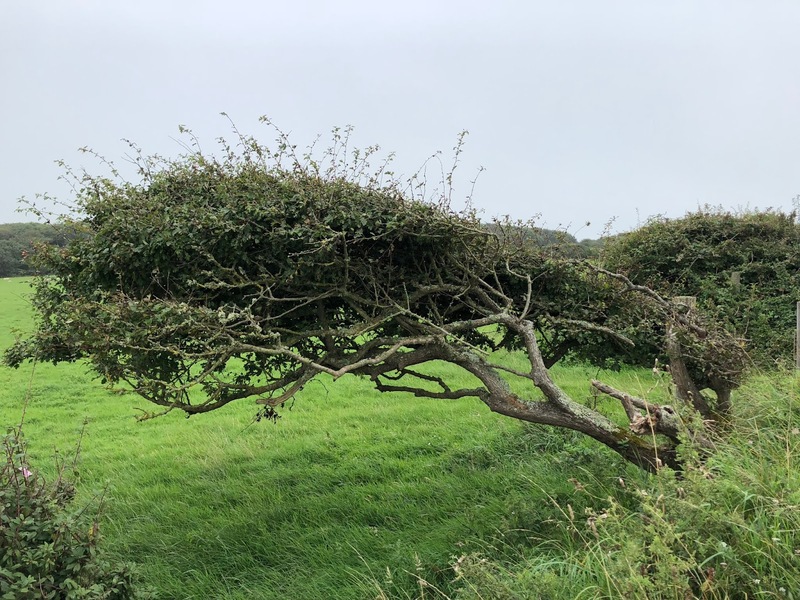 It’s not a willow, but it’s still a cool tree. UPDATE: closeup visualisation of the trunk of this sweet chestnut. Happy New Year and welcome to 2018. Well, 2017 was a doozy and finished off with the very enjoyable aspect of seeing our work appear on the Judi Dench: My Passion for Trees. The programme seemed to go down extremely well, with seemingly universal outstanding reviews (see here, here and here for example, as well as my personal fave: "Come for the lols, stay for the poignant thoughts about death."). We've already had some interesting feedback. As well as some "interesting" feedback 😁. It was certainly quite entertaining following #MyPassionForTrees trending on twitter on the 20th December! There's definitely some new possibilities opening up as more people see this work. More to come this year I think! Twenty sequioas from the Grove of Old Trees, Sonoma, California. Meanwhile, we're off back to Surrey, Kew and then plans for trips back to Malaysia, Brazil and elsewhere. Onwards and upwards. Trees and champagne for everyone!